Shahid Datawala was born in 1974 in Mumbai. In 2001 he exhibited 'A Walk with Pillars' at Max Mueller Bhavan, New Delhi. From 2007-2008 he exhibited 'Dress Circle' at Tasveer in Bangalore, Calcutta, Mumbai and New Delhi. From 2008-2009 he exhibited Shadow Boxing at Tasveer in Bangalore, Calcutta and New Delhi. In 2010 he exhibited 'Where the city rests' at Matthieu Foss Gallery, Mumbai. In 2015 he exhibited solo, ‘I Once Was Alive’ at Gallery 7, Mumbai. In 2007 he took part in a group show at The Newark Museum, New Jersey. In 2008 he took part in ‘India: Public Places, Private Spaces’ at Minneapolis Institute of Arts, Minnesota. 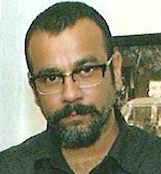 In 2008 he participated in ‘Post Visual World’ at Priyashri Art Gallery, Mumbai. In 2009 he took part in ‘Saturday is Cleaning Day’ at The Loft. In 2010 he participated in ‘Click’ at Vadhera Art Gallery, New Delhi and Grosvenor Gallery, London. In 2010 he took part in ‘Where Three Dreams Cross’ at White Chapel Gallery, London. In 2009 he was awarded the Edida Furniture Category Award and in 2010 he received the Edida Designer of the Year by Elle Décor. He was also the chief designer for Palette for 7 years, a furniture design store in Mumbai. He is currently working on his next solo exhibition and a series of photography book projects on various aspect of Mumbai. He designs clothes and is a jewellery maker. He has photographed extensively for various publications.